You are currently browsing the Fat Cyclist weblog archives for July, 2008. A Note from Fatty: Thanks go out to Adam, Dug, Jill, Jim, Kent, Brad, and Bob (and mgrinrr, who had the initiative, good sense, and moral courage to self-tag, thus innoculating against leprosy), each of which has been wise enough to avoid leprosy and get in on the ground floor of what I predict will be the most awesomely successful blog meme in the history of awesome blog memes. Surprisingly, both Dug and Jim made the distinction between giving up ice cream and giving up gelato. Coincidence, or separated at birth? You decide. A Late-Breaking Note from Fatty: Bike Snob NYC has wisely elected to avoid leprosy. Read his response here. There are certain memories that stick with you forever. One of mine is my shopping experience for my first serious mountain bike. I had no idea what I was looking for, but the manager of the bike shop — Scott Calhoun — was someone I knew, liked, and trusted. “What bike should I get?” I asked. “This one,” he said, indicating the Specialized Stumpjumper M2. “Well, what bike do you ride?” I asked. “This one,” he said, indicating the exact same bike. Since then, I’ve moved from being the guy who needs to ask a trusted expert what bike to buy to being the guy (notice I didn’t say “trusted expert” when referring to myself) other people ask. I know most of the brands and models, and if I don’t know, I can quickly find out. 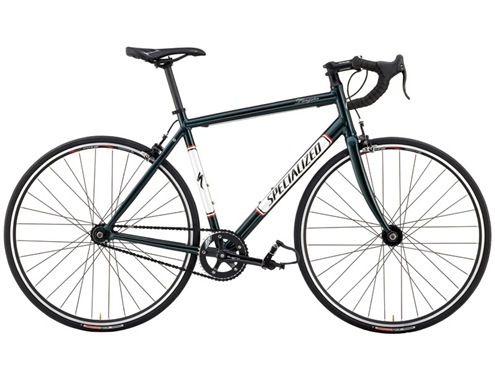 I’ve become so comfortable with bikes that I’ve forgotten exactly how strange and confusing shopping for a bike must be to someone looking to buy their first (or second, or whatever) serious bike. You, of course, can probably tell that there are masive differences between these two bikes. The one on top is a singlespeed. The one on the bottom is carbon. The one on top is clearly a ride-around-town bike; the one on the bottom is for serious racing. But try this experiment: show the above two images to someone who doesn’t know anything about bikes. They will probably note that both bikes are from Specialized. They may think the decals on the top bike look a little bit cooler and that the one on the top comes with pedals, while the one on the bottom does not. They probably will not deduce that the bike on top has an MSRP of $690, while the one on the bottom has an MSRP of $8500. 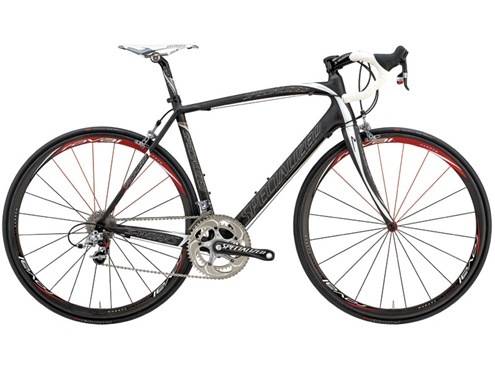 OK, to be honest, I also am a little bit dumbfounded at the price on the S-Works Tarmac SL2. I mean, no matter how much awesomeness they add to the bike, it’s still just a Specialized. Isn’t owning a Tarmac SL2 is like having the most awesomely tricked out Toyota Corolla in the world? OK, I’m drifting away from my point in a big way, here. I need to reel myself in. Today, I was reminded of how confusing it is to be a rank novice shopping for a new bike, because — once again — I am a rank novice, shopping for a different kind of ride. You see, Susan hardly ever asks for anything. And she even more hardly ever asks for anything big. So when she, this morning, said she’d really like to have something that would let her ride around the neighborhood so she could walk the girls to school, or go with us to the park, or otherwise just get around without having to be pushed or driven, well, I was immediately all over it. 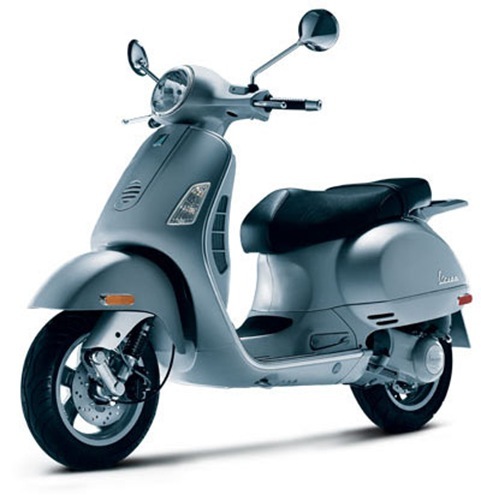 Until, of course, I got completely overwhelmed by the price range, feature variety, and incredibly variance in brands and models, even as I could not tell any difference at all between a $700 scooter and a $4000 one. I mean, it’s worse than not knowing which scooter brands I should be looking at. I don’t even know what kind of questions I should be asking. I’m like the guy who comes into a bike shop, interested in buying a bike to get in shape, but to whom it’s never even occurred that there may be different kinds of bikes for trails and pavement, and that maybe I should know which I want to do. Do I want three wheels, or four? I dunno. How long should I expect the battery to last? Beats me. Which brands are the most reliable? No idea. What’s a reasonable top speed? Or should I even care? Does it even matter whether there’s a light system and traffic signals? I don’t think Susan’s going to take this thing downtown (I’m pretending here that Alpine, UT has a downtown). 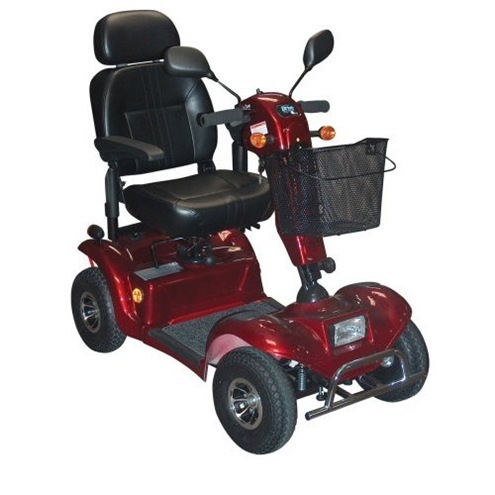 What I need is a trusted advisor — someone who can just tell me the right scooter to get, because they know all about this kind of thing. And to the rest of you: Thanks. When you bought jerseys or sent in donations, you made it so I can get Susan as nice of a scooter as I think she deserves, without worrying much about cost. And besides, no matter how nice the scooter, it won’t cost a third as much as a Tarmac SL2. Remember how, when you were a kid, from time to time a friend would send you a chain letter, telling you a story about someone who got this letter, forwarded it, and now has received untold riches? And then — by way of contrast — there was another guy who received this letter, didn’t forward it, and — the following day — got leprosy, a swollen goiter, and a severe case of halitosis? Well, blogs have something like that, but instead of “chain letters,” they’re called “Tagging.” Generally, the chain letter tag directions instructs you to describe five random facts about you nobody else knows, and then to link to five other (usually topically similar) bloggers, who must do the same thing. First of all, the assigned task — 5 random things about me — asks me to reveal too much all at once. If you want to know five random things about me, just read my blog for five days. Don’t go asking me to give up a week’s worth of material in one post. And then he fell asleep, drooling into his keyboard, while the keys left a QWERTY impression in his corpulent, veined cheeks. I may be ranting a bit here. My point is, the questions could at least be topical — you know, since I blog about biking, the questions could be about bikes. Third — and finally — the Tag meme should carry a promise of reward and corresponding threat of infamy, financial ruin, and probable dismemberment if you brake the chain. Here. I’ll show you what I mean. Congratulations! Your blogging friend at [YOUR BLOG URL HERE] has tagged you! You must now — within the next 24 hours — answer the below questions as a post in your blog, and then tag three other biking bloggers. Please, even if you know what you were going to write about today or tomorrow, put those ideas aside. This is much more important. For example, Elden Nelson answered these questions and tagged , and he won a Bloggie, confirming that he is the most awesome sports-related blogger in the whole freaking world! In contrast, Bob Bringhurst failed to answer these questions, after which he developed a serious case of ennui, and his hair grew out to become an unruly mess. You don’t want this to happen to you, do you? Fine, then. Answer these ten (fun, easy, and interesting) questions already. It would be my WaltWorks. I love the way that bike looks and rides, and I can’t imagine ever loving another bike more. Seriously, it’s my favorite bike ever. But that’s still a cheater answer, since my WaltWorks — currently set up as a fully rigid SS — can also be set up as a geared bike with a front suspension. And skinny tires combined with the big wheels could make it a serviceable (though not great) bike for getting around on the road. Yes, I do already have that dream bike, and it’s actually more than I hoped it would be. I’d like to point out, though, that one of the things I love about bikes is that even the most expensive, elegant, beautiful bike in the world still costs less than a Honda Civic. Bikes are one of the very few obsessions in the world where a normal — i.e., not fantastically rich — person can conceivably own the very best incarnation of his dream ride, without breaking the bank. I would choose Tibble Fork, and I would do so without hesitation. It is really my very favorite ride in the world, and I think I could do it happily every day for the rest of my life. I explain why it’s my favorite ride here. Yeah, totally. That’s evil on a movie villain scale. I ride both, because I am a well-balanced and intelligent person, who sees the good in most things. I prefer mountain bikes, though I have definitely hurt myself much more often riding MTB than road. I am suddenly concerned about what this says about me. Still, I like riding MTB better because it’s more fun for me. I am at a loss as to why this is true, but it is. I have never ridden a recumbent. In order for me to acquiesce to riding a recumbent, I would have to be out of town, where nobody I know could possibly see me. Also, I would have to have a good reason, like somebody offering to let me ride their recumbent. I would claim to give up ice cream, but would sneak it when nobody was around. Impossible to sneak bicycle riding. Too much physical evidence laying around. I’m fairly confident I soil myself. Next, I offer the bear my bike, in exchange for which I get to keep my life. From what I understand, bears like bikes. At least, the one I saw at the circus seemed to. I hereby tag the following bloggers, of which there are more than three, because I want to get this thing really rolling. And also, because I suspect that most of them won’t do it. Oh, and if I didn’t tag you, but you wish I had, by all means please consider yourself tagged. Eleven days ago, I posted about a mountain bike wipeout I had. What I haven’t talked about is the agony I’ve gone through since then. No, not the agony of a separated shoulder, though I’ve had a few moments of exquisite pain — usually brought on when I forget, or do something reflexively (like when I tried to catch a wayward frisbee yesterday…not a good moment for me). The agony I’m talking about is the agony of not riding my bike. See, I have a big race — The Leadville 100 — coming up in just a few weeks, and now’s not exactly a great time for me to be taking a week or two off the bike. So I haven’t. In fact, I think I took off a total of three days — enough time that I was confident I could lift my right arm high enough to rest it on the handlebar. Yes, I knew when I first got back on the bike that I couldn’t handle it. And I knew when I did a ride on my singlespeed road bike last week that my shoulder wasn’t up to the effort it took to row a bike for twelve miles of climbing. And yet, I did it anyway. I couldn’t help myself. What I needed was something — some device attached to my bike — that would have compensated for my lack of common sense. And — face it — you’ve probably done the exact same thing: gotten back on your bike and started riding when your recovery and safety would have better served by your spending quality time with the television. And that, my friends, is why I’m pleased to announce that I have invented exactly such a device: The Bike Limiter(tm). Available by prescription, the Bike Limiter is actually a set of mechanical devices attached to your bike(s) in key locations (these will be made clear momentarily). The prescription will determine specifically how and when the Bike Limiter works. Day 1 – 7: No riding whatsoever. If you do try to ride during this time period, razor blades will spring through the rims of your wheels, slicing your tires to ribbons, and your handlebars will become white-hot, possibly setting your bar tape or grips afire. Day 8 – 14: Short, seated rides only, on flat terrain. You are now allowed to ride for thirty minutes or so, but only on flat roads. If the inclinometer notices that you are on a grade of 4 degrees or greater, it will immediately apply the rear brake until you have turned around. If excess weight is applied to the handlebars, they will deliver a painful (but not debilitating, hopefully) electric shock. And after the thirty minutes has elapsed, your seatpost will begin sliding into the seattube at a rate of 1cm / minute (the Bike Limiter uses metric measurements, naturally). If you go offroad (as sensed by excessive vibrations in your bicycle), your saddle catches fire. Day 15 – 30: No epic rides. Two hour rides are now allowed. However, if you exceed this allotted time, your front derailleur shifts radically, dropping your chain. If you continue your ride, the rear derailleur does the same thing, but in such a way as to give you horrible chainsuck. Day 31 – 45: No stupid technical stuff. The Bike Limiter uses a GPS to validate where you’re riding against a comprehensive topographical map of the world, all rated 1 – 10 by technical expertise required. If you get on a trail of a difficulty greater than what your doctor recommends, the Bike Limiter sets off a siren for three seconds, giving you time to dismount your bike. After that, it releases quick-drying epoxy into your headset, completely freezing out your steering (a highly-effective deterrent to continuing an unwise mountain bike descent. And it comes with a handy remote-control key fob, so that when you park your bike, you can click to arm it, making for a pretty darned good anti-theft mechanism. The Bike Limiter is pure genius. As a substitute for common sense for injured cyclists, it couldn’t have a better-targeted demographic. 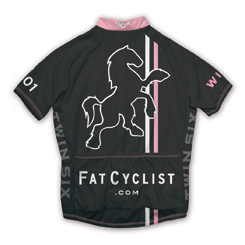 PS: Pre-order week for the 2009 Fat Cyclist jersey is now over. A big “thank you” to those of you who took the time to place an order. For those of you who forgot, didn’t have the money right now, or just weren’t sure you wanted one, don’t worry: we ordered a few extras. They’ll go on sale when they arrive in early November, and I’ll give ample warning on when they’ll be available. Also, a big “Thanks” to the guys at Twin Six, who somehow manage to outdo themselves with jersey designs, and then do a great job of managing the influx of orders that comes their way. PPS: Check out yesterday’s issue of The Toledo Blade. Lukas Kummer is featured in an article about bike commuting, and is looking good in his Fat Cyclist jersey. Way to fly the flag, Lukas! A Note from Fatty: This weekend’s your last opportunity to pre-order a 2009 Fat Cyclist jersey. Click here for details, or go to Twin Six to order (Men’s or Women’s) now. Thanks! We’ve never met before, but I just wanted to say that I’m a huge fan…of your uncle. You see, Travis, yesterday my wife and I spent the entire day going from MRI to radiation to radiation marking and simulation and then to meeting with the doctor. I, laughably, thought that it was my ninja-like skills with dealing with the medical bureaucracy that made all the doors open and appointments fall into place. It turns out that it was your uncle — Dr. Richard Brown — who made everything fall into place. Evidently, after meeting with my wife on Wednesday and hearing her complaints about losing feeling in her legs, he started thinking about her. And worrying. And wanting to find out what was wrong. From what he describes, it bothered him all that evening. I don’t know if all doctors bring their work home with them, but I’m glad your uncle did. Anyway, your uncle had his nurses and receptionists make calls and get everything in place, so when I called to demand we get working now on finding out what was wrong with Susan, they were already on it. So yesterday, acting on your uncle’s hunch, we did the spine imaging and then brought the images on over to him. There’s a tumor in her spinal cord, blocking the nerves that send to and receive messages from the legs. Within an hour, Dr. Brown had a plan in place: Susan would get marked up for radiation right away. Then your uncle would stay late that night planning out how the area where the radiation would target. Then Susan would come in the next day (that’s today) and start the radiation. And your uncle would open up the clinic on Saturday and Sunday so she could continue the radiation without losing any more time. Then he asked why I shave my head. I said it’s to avoid having helmet hair. And that’s how your name came up. He says he’s your uncle, and that you’re a good kid (though I have to be honest and say that I think the whole 69er thing is just wacky). Anyway, Travis, your uncle’s a good doctor and a good man. I thought you should know. Originally uploaded by Fat Cyclist. ate (parked in the clinic parking lot) they called me back. How did anyone ever communicate before there were mobile phones? causing the numbness and inability to move her legs. going to get Susan set up to start radiation on that part of her spine. 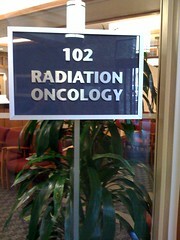 of saving a little cash by consolidating radiation appointments.